Hey there Mama! Are you trying to grow a healthy baby? Or, are you breastfeeding and hungry constantly? Do you have a bunch of hungry mouths to feed? This meal plan is for you! Here you will find a mix of clean eating, real food meal ideas that you can eat throughout the week. 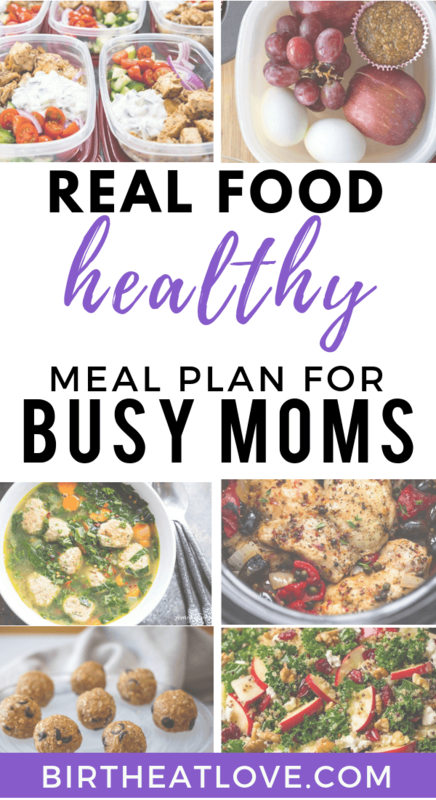 The focus of this meal plan is on quick and easy recipes that are family friendly and support Moms during pregnancy, postpartum and breastfeeding. 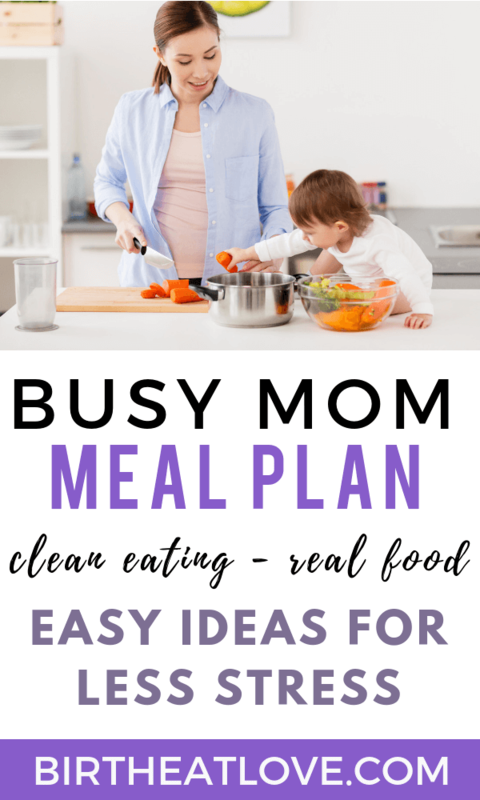 Check out this post for more on the system I use as a busy Mom to meal plan for my family of 6. Ready to get meal planning? Here are a few recipes and ideas that will help get healthy meals on the table (with less stress). Choose recipes from this list and then write out all the ingredients you will need. Before you go grocery shopping, make sure to check out these unique tips for how to save hundreds on groceries. Red Raspberry Leaf Iced Tea – this iced tea is perfect for pregnant moms, but also good for postpartum recovery and helping milk supply if breastfeeding. If you experience lots of painful period symptoms, this is also a great tea to drink daily. Make a big batch and drink all week! Here are 3 breakfast ideas to alternate throughout the week. #1 – Easy Healthy Breakfast Egg Muffins – these egg “muffins” are great for an easy make ahead breakfast. #2 – Whole30 Sweet Potato Breakfast Bowl – sweet potatoes are filled with nutrients and can even help boost milk supply. #3 – Meal Prep: Breakfast Bistro Box! Need a breakfast you can take with you? These make ahead breakfast boxes are perfect for busy mornings! Want more breakfast ideas, read this post with even more healthy pregnancy breakfast ideas. Need easy healthy lunches? Here are a few ideas to try this week. #1 – Greek Chicken Meal Prep Bowls – These are made with marinated grilled chicken, cucumber salad, and tzatziki! #2 – Curry Chicken Salad Lettuce Wraps – Need a milk supply boost? Try this amazing chicken salad for lunch. Dinner ideas that are healthy and easy to make! #1 – Quinoa Veggie “Fried Rice” – makes a great meal or side dish. #2 – BBQ Chicken Zucchini Boats – a 30 min meal using precooked chicken. #3 – Turkey Meatball and Kale Soup – Because we all could use more greens in our life, try this hearty soup made in about 30 minutes. #4 – Autumn Kale Apple and Quinoa Salad – More greens and veggies ladies!! This is the perfect fall salad. Want more dinner recipes? Check out this list of over 25 dinner ideas featuring superfoods! Breastfeeding Mom? These soup recipes are great for boosting milk supply! Healthy snacks and treats you can eat without the guilt! Dark Chocolate Sea Salt Grain-free Chickpea Granola – so many superfoods in this unique grain free granola. Perfect for pregnant and breastfeeding moms. Pumpkin Chocolate Chip Energy Bites – so perfect for pregnant mamas as these have date fruit which can help you have a faster labor. Chocolate Cherry Fat Bombs – Get more healthy fats + satisfy your sweet tooth with these yummy fat bombs! For more healthy snack ideas click here! Ideas for your baby or toddler! Baby Food Oatmeal Bites – like superfood for babies! Zucchini Muffins for Baby – Easy low sugar, egg free, dairy free muffins for baby led weaning. Want more baby led weaning ideas? Follow my board on Pinterest! Need even more ideas for how to feed your growing family healthy meals? Definitely check out this free ebook with 20 healthy, quick family meals made from all real food ingredients. It’s a super helpful resource for busy moms. Did you find this post helpful? Please pin it for later! It helps other Moms find this info too! Thank you!! Our passion here at Birth Eat Love is helping busy moms make healthy eating easier. 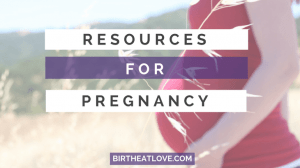 We have tons of resources to help you have a healthy pregnancy and postpartum. Make sure to sign up for your free grocery shopping list below with all the best foods for pregnancy and breastfeeding. This will make knowing what to buy when you shop so much easier. For more on how to stock your fridge before baby arrives, check out our Ultimate Food List. 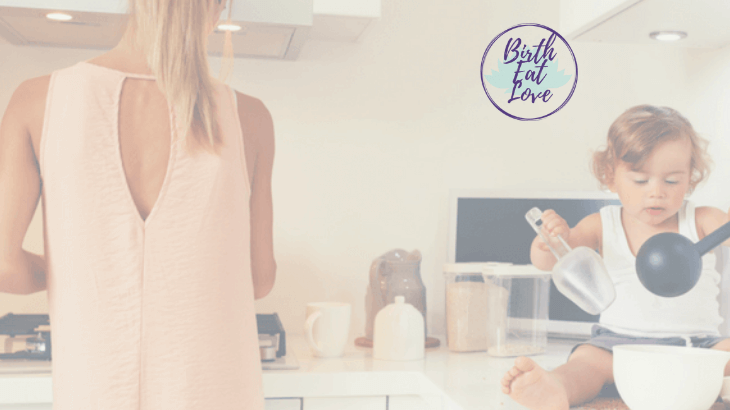 Are you a breastfeeding mom? Read this post on foods that can tank your milk supply and this one on foods that increase milk supply. Stop stressing about what to eat! Sign up to get your Ultimate Grocery List! Featuring the BEST foods to support Pregnancy and Breastfeeding. Make eating healthy easier and save time with this easy printable list. Healthy Eating advice, breastfeeding diet, breastfeeding food, gluten free, healthy eating, meal planning, pregnancy diet, pregnancy food, Slow cooker. permalink.